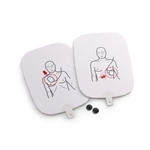 The unique Pad Sensing System automatically detects when each pad is placed on the manikin which simulates a live AED allowing for a more realistic training class. Quality pads that last. High quality training pads that will last a long time with a minimum of 50-60 applications. Pad replacement is affordable and easy. Just replace the pad not the cord. 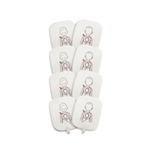 A uniquely designed pad adhesive that adheres and removes well to any manikin on the market. 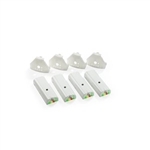 No more damaged pads or cleaning adhesive off your manikins. One set of Pediatric Pads with one storage case. 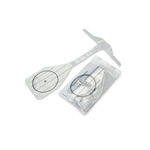 Prestan Professional Child 50-Pk Face-Shield Lung-Bags for use with Child Manikins. 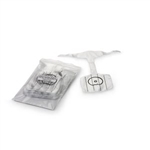 Prestan Ultralite 50-Pk Face-Shield Lung-Bags for use with Ultralite Manikins. 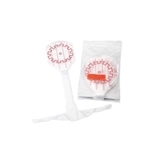 Prestan Professional Adult 50-Pk Face-Shield Lung-Bags for Adult Manikins. Universal size 30-52" chest size, weight is 90+Lbs. One easy to install replacement monitor for your Prestan Child Manikin. One easy to install replacement monitor for your Prestan Infant Manikin. One easy to install replacement monitor for your Prestan Adult Manikin. They can be used for towing a victim, supporting the rescuer, or handed to a victim for assistance. Both models are triple-dipped in a red vinyl covering to protect them from the elements. 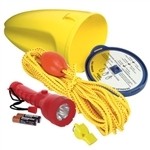 Our 50� rescue tube has a 2� loop shoulder-strap.. Our 40� rescue tube has a 2� shoulder strap equipped with brass clip. Obstacles for lifesaving competition are lightweight and constructed of CPVC materials, fit between existing lane ropes and provide the opportunity to add a different component to training and programming. The Prestan AED UltraTrainer� provides the options instructors have been waiting for. 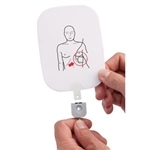 Combining the most recent technology with realistic features not found on other AED Trainers, this product will excel in any training atmosphere. 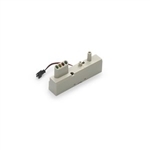 It is a compact and customizable unit providing quality, durability and affordability. 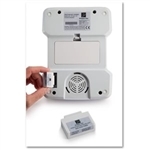 The Prestan AED UltraTrainer� is sure to be an industry favorite. 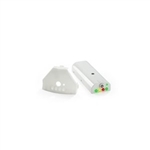 The unique Clicker Mechanism provides an audible confirmation when the correct compression depth is reached, guiding to the appropriate force when administering CPR compressions. 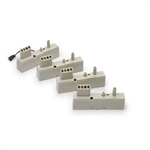 Four easy to install replacement monitors for your Prestan Adult Manikins. Four easy to install replacement monitors for your Prestan Child Manikins. Four easy to install monitors for your Prestan Infant Manikins. Life-like features and weight allows for realistic infant CPR training. Sculpted body contours and realistic skin feel help prepare students for real life rescues. A breakthrough in design, Prestan Professional manikins let instructors set up and pack up at training sites in minutes, and provides students with a realistic training experience that prepares them for real rescues. ? 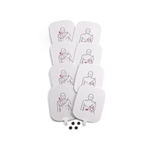 A clicker mechanism that helps students learn to use the right amount of force in order to compress the victim�s chest to the correct depth � great for boosting students� confidence in their ability to administer adequate compressions. A head that simulates the way an actual victim�s head would move. Face/head tilt enhances the CPR learning experience and teaches students how to open the airway during CPR. One green light shows students they have reached adequate compression rates � two green lights tell students to maintain their current rate. 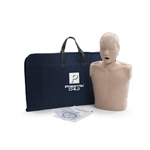 Easy to fill and drain lifesaving rescue training manikin. Ideal for lifesaving courses, lifeguard training, employer screenings and lifesaving sport athletes. Similar to the competition manikin without the paint and caps. Open at the bottom without a cap, that fills with water easily and submerges to simulate an unconscious victim. Made in Canada by the Lifesaving Society. 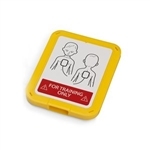 Prestan Professional AED Trainer comes with English/French Module, 4 'C' batteries, one set of Adult Training Pads with Case, an Instruction Sheet and a blue nylon Carrying Case. Quality & Durability The same quality and durability you expect from Prestan. Clear confident voice prompts. Also CPR prompts to help the student keep pace with chest compressions. 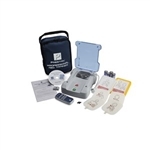 Prestan Professional AED Trainer Kit comes with English/French Module, 4 'C' batteries, one set of Adult Training Pads with Case, an Instruction Sheet, a blue nylon Carrying Case and includes an AED Trainer Remote, one set of Pediatric Pads and a Pediatric Pads Case. Complies with ILS manikin specifications. Endorsed by ILS effective Jan 14, 2010. One of just 3 mankins in the world approved for use in ILS sanctioned competitions and the only one made in Canada approved. The Prestan Professional Collection contains 1 Adult Jaw Thrust Manikin w. monitor, 1 Child Manikin w. monitor and 1 Infant manikin w. Monitor. 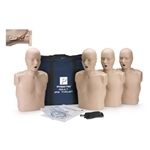 This collection is an excellent starter pack for trainers and comes with 10 Face-Shield/Lung-Bags per Manikin, a nylon Carrying Case with a detachable Shoulder Strap and pre-installed Batteries for the Monitors. 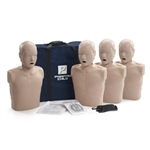 Convenient 4 Pack - The Prestan Professional Child Manikin is designed to look like a child verses an adult with less prominent body structures and softer, more childlike facial features. It is smaller and thinner than the Prestan Professional Adult Manikin. Yet, still realistic to the eye and the touch. 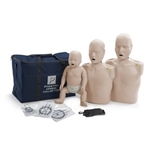 Convenient 4 Pack - Life-like features and weight allows for realistic infant CPR training. Sculpted body contours and realistic skin feel help prepare students for real life rescues. A breakthrough in design, Prestan Professional manikins let instructors set up and pack up at training sites in minutes, and provides students with a realistic training experience that prepares them for real rescues. The same quality and durability you expect from Prestan. Also CPR prompts to help the student keep pace with chest compressions. The Set Up Buttons allow for fast and easy changes to the setting of the trainer. 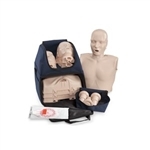 The Prestan Professional Family Pack consists of Two (2) Adult Jaw Thrust Manikins (with CPR Monitor with AA batteries), One (1) Child Manikin (with CPR Monitor with AA batteries) and Two (2) Infant Manikins (with CPR Monitor with AA batteries). Also includes 20 Face-Shield/Lung-Bags, 10 Child Face-Shield/Lung-Bags, 20 Infant Face-Shield/Lung-Bags, an Instruction Sheet and a blue nylon Carrying Case. 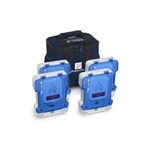 The Kit includes 4 Prestan Professional AED Trainers with English/French Modules and 16 pre-installed 'C' batteries, 4 sets of Adult Training Pads with Cases, an Instruction Sheet and a blue nylon Carrying Case. Also includes 4 AED Trainer Remotes with pre-installed batteries and 4 sets of Pediatric Pads with Pediatric Pads Cases. 6 Line Throw Ropes Your Choice of 3, 7m and 3, 10m or 6, 17m. Please put in the order notes your choices.